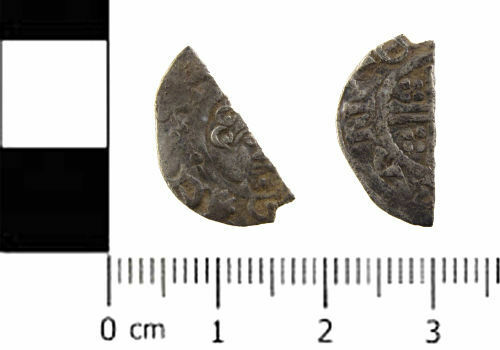 A silver Medieval coin; a cut half penny of Henry III (1216 - 1272), probably Class 7a which dates from AD 1217 - 1222. It was minted at Canterbury. See North number 978. The letter A is distinctive. One corner of the coin is missing. It is 17mm diameter, 8.9mm wide and 0.7mm thick. 0.54g. Obverse description: Forward facing crowned bust holding sceptre. Two hair curls on left side with pellets.